What Is Tamari in Japanese Cooking? Tamari is a Japanese sauce made of fermented soybeans. It is thicker and has a more balanced flavor than Chinese soy sauce, making it a good choice for a dipping sauce. Tamari is often made without wheat, while soy sauce usually contains wheat. You may think of soy sauce as a singular condiment, but venture into your local Asian grocer and you'll soon learn that there are dozens of different types of soy-based sauces, all with slightly different tastes and consistencies. Tamari is just one of these soy-based sauces and offers its own distinct flavor. You can substitute tamari for soy sauce, and vice versa, though you may find that you have a preference for one flavor over the other. Tamari has a bolder flavor with a less salty taste compared to soy sauce and is more of a general seasoning sauce. Because of this, it combines well with a variety of other flavors and works nicely in noodle dishes or vegetable stir-fries. You can use tamari in place of soy sauce in any vegetarian recipe. Tamari is also less likely to have additives. Often the ingredient list is just water, soybeans, and salt. By comparison, the ingredient list on a typical bottle of soy sauce usually contains wheat, which is used to help the fermentation process, and a preservative such as sodium benzoate. Tamari is a great alternative for those on special diets for health or ethical purposes, but does contain soy and salt and thus needs to be avoided by those with a soy allergy or who need to cut down on sodium. Many tamari brands have added salt so be sure to read the label if this is a concern for you. For example, 1 tablespoon of San-J Tamari has 980 milligrams of sodium. This is slightly more than Kikkoman Soy Sauce, which has 960 milligrams in a tablespoon. On the other hand, tamari is a good alternative for those on a gluten-free diet. Nearly all varieties of tamari produced for consumption in the U.S. are indeed gluten-free, though tamari can contain trace amounts of wheat. If you're shopping at Whole Foods, Trader Joe's, or your regular grocer, chances are that all of the tamari you find will be labeled as gluten-free and will be safe for anyone on a gluten-free diet. Kikkoman brand tamari is one example that is not gluten-free and contains wheat (though they do make one type of tamari that is gluten-free and clearly labeled as such). Tamari is also a vegetarian and vegan food. There are no animal products are found in tamari, so this Japanese sauce is ideal to use in vegetarian and vegan dishes. Whether due to a soy allergy or simply because you'd like to find something different, there are a few products you can use to substitute both tamari and soy sauce. 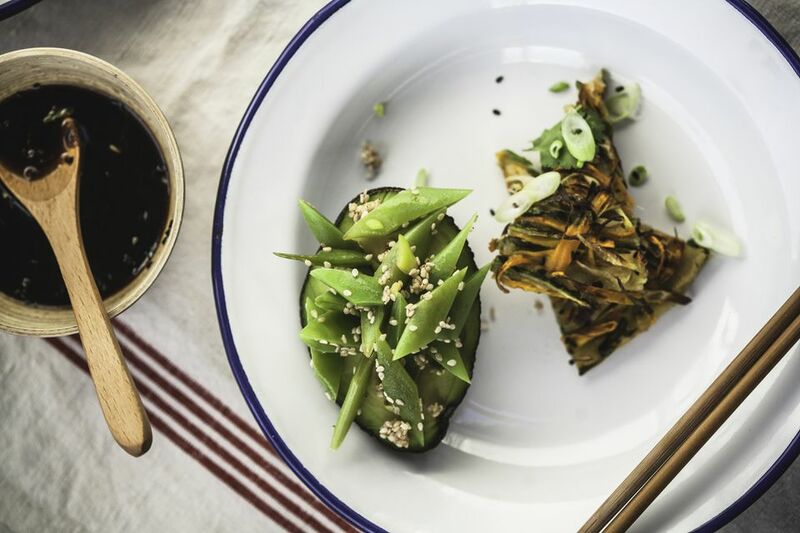 Even though soy sauces are a key ingredient in some Asian recipes and many vegetarian and vegan recipes also use them just to enhance flavor, they can easily be omitted or substituted with other flavor enhancers. Ingredients such as spices, fresh herbs, or even plain salt (sea salt or kosher salt are always best) can take the place of soy sauce, or you can try some other unique ingredients. Coconut aminos are made from coconut sap and have a similar salty-sweet taste to tamari, and Bragg's liquid aminos is a salt-free seasoning that is touted as a healthy alternative to soy sauce. If you are following a raw vegan diet, nama shoyu (another type of soy sauce) may interest you, or you can make your own homemade raw vegan nama shoyu using portabello mushrooms.